As we close out another year we are going to take a look at some of the other NASA missions that are active in the Solar System exploring other planets. While the future looks a little uncertain at the moment due to the growing budget crisis there are plenty of spacecraft still in operation. We start our journey with two of the longest serving craft in the NASA fleet, Voyager 1 & 2 launched in 1977 have been traveling away from earth ever since and continue to function. Their primary mission was to explore Jupiter and Saturn after making a number of discoveries at each their missions where extended. Voyager 2 went on to explore Uranus and Neptune. They are now traveling at the very edge of our solar system in the region called the Heliosheath where the influence of the solar wind from the sun is almost complete diminished. We don’t currently know when the craft will actually exit the solar system however it is expected to be close. At the time of writing Voyager 1 was 17 billion km from the sun and Voyager 2 was 14 billion km away. At this distance it takes more than a day for a signal to travel to the craft and back at the speed of light. The craft are expected to operate until ~ 2020 when they will no longer have enough power for their instruments. 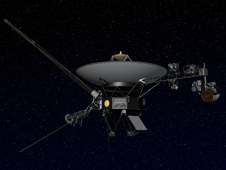 Follow the progress of the Voyager’s at there website. 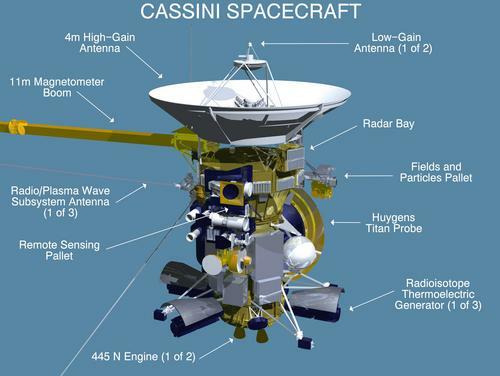 Next we take a look at the Cassini-Huygens spacecraft which is currently in orbit around Saturn. Launched in 1997 the craft spent almost 7 years travelling to the Saturn system before entering into orbit. Cassini-Huygens is actually two physical spacecraft and Orbiter which is named Cassini and is still in orbit today and a lander named Huygens which descendant into the atmosphere of Saturn’s moon Titan shortly after the combined craft arrived at Saturn. Initially designed for a four year mission in orbit around Saturn the mission has been extended several times with the current plan to crash the orbiter into Saturn in 2017. Follow the progress of Cassini at it’s website. 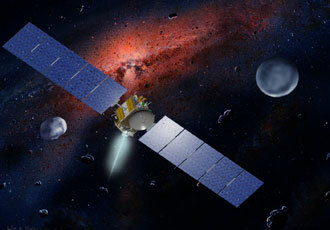 Next we visit a spacecraft that will be the first two orbit two different objects in the Solar System, currently in orbit around the asteroid Vesta providing a wealth of information about the rocky object, once it’s mission is complete it will then travel onto the dwarf planet Ceres and again go into orbit. Both objects are found in the asteroid belt between Mars and Jupiter and are believed to have been created when the Solar System was created. The decade long mission including travel time will allow scientists to learn more about the creation processes. Follow Dawn’s progress at it’s website. The Messenger spacecraft is the first to orbit Mercury after spending more than 6 years traveling to the planet and covering more than 7.9 billion kilometers. Unlike most of the other planets traveling to Mercury was a lot more complex due to how close it is to the Sun instead of a direct approach which would have constant accelerated the craft Messenger had to flyby Earth, Venus and Mercury several times before finally inserting into orbit. Follow Messenger’s progress at it’s website. The New Horizon’s spacecraft will be the first to fly-by Pluto, launched in 2006 the craft is rapidly approaching Pluto but still has just under 1300 days until closest approach. New Horizons is often erroneously given the title of Fastest Spacecraft Ever Launched, when in fact the Helios probes are the holders of that title. To be more specific New Horizons achieved the highest launch velocity and thus left Earth faster than any other spacecraft to date. It is also the first spacecraft launched directly into a solar escape trajectory, which requires an approximate velocity of 16.5 km/s (36,900 mph), plus losses, all to be provided by the launcher. In January 2007 New Horizon’s speed was increased by a gravity assist from Jupiter sending it hurtling towards Pluto at 8,900 mph faster. However due to the gravitation influence of the Sun even at that distance the craft has slowed as it progresses towards Pluto. New Horizon’s is now closer to Pluto than any previous spacecraft has been, the next significant event in the journey won’t occur until August 2014 when it will cross Neptune’s orbit. Flyby of Pluto will occur in July 2015 when all the science instruments will be pointed at the planet to gather as much information as possible. After the successful completion of the primary mission to Pluto the craft may approach other Kuiper belt objects before leaving the Solar System in 2029. Follow New Horizon’s progress at it’s website. The last spacecraft we will look at today is the newest craft Juno, launched in August 2011 the craft began a five year journey to Jupiter to explore the origin and evolution of Jupiter. Expected to arrive in July 2018 the craft will then orbit Jupiter 33 times gathering information about the amount of water in it’s atmosphere, measure the composition, temperature, cloud motions of the giant planet. Map Jupiter’s magnetic and gravity fields and explore the magnetosphere near the the planet’s poles. Follow Juno’s progress at it’s website.